Kolkata holds an important place among all the states of India because of its rich cultural heritage. The city is known for its numerous festivals which are celebrated with great joy in almost every corner of the state. One such festival is Bhai Phota Festival of Kolkata. The festival existed since ages but nowadays it has got the tinge of modern era in it. No matter how busy people have become and how people have got their outlook changed regarding many old festivals, Bhai Phota gets a special status. The rituals of this festival are deeply rooted into the Bengali Society. Most of the Hindu Festivals are celebrated in order to pay homage to various Gods and Goddesses. These festivals are celebrated to commemorate birth of a God or Goddess, the marriage ceremony of a God/Goddess, or victory of divine powers over the evil ones. Bhai Phota is a unique Hindu Festival that conveys the strong bond shared by sisters and brothers. On this festival, sisters keep fast and they wish for the long life and prosperity of their brothers. This festival is celebrated two days after another Important Hindu festival, the Diwali. Bhai Phota falls in Shukla Paksha of Kartik Month of Bengali Calendar. Bhai Phota is known as Bhai Dooj in rest of India except Bengal. Literally Bhai means brother and Phota means ‘a mark’ in Bengali Language. The name of the festival has its origin in the rituals of this festival. On this occasion, sisters put a Tilak on the forehead of their brothers. On the day of Bhi Phota, sisters fast since morning. They make sandalwood paste and arrange for ‘Durba’ or tender grass shoots and paddy grains. Brothers are made to sit on asanas or floor mats and tilak of sandalwood paste, curd and honey is put on their forehead by the sisters. A lamp is lit and when sisters put tilak on the forehead of their brothers, they chant a mantra meant for this occasion. Sisters and brothers wear traditional Bengali Dresses for Bhai Phota. Sisters wear saree and brother wear Kurta Pajama or Dhoti Kurta. If brothers are younger they get blessings from their sisters with ‘Durba’ and Paddy Grains while elder brothers bless their younger sisters with the same things. After this ritual is over, brothers are offered dish full of different types of traditional sweets. Many special sweets are sold at the sweetmeat shops on this auspicious occasion. While sisters put tilak on their brothers’ forehead, conch shells are blown. On this occasion traditional Bengali Breakfast and Lunch are prepared. Typical breakfast is Luchi and Aloo Dum. For lunch different types of fish are made. Apart from Rohu, Hilsa, Prawn, Pabda, Chital etc are the fishes prepared on this special occasion. Special dishes of mutton and chicken are also prepared on this occasion. 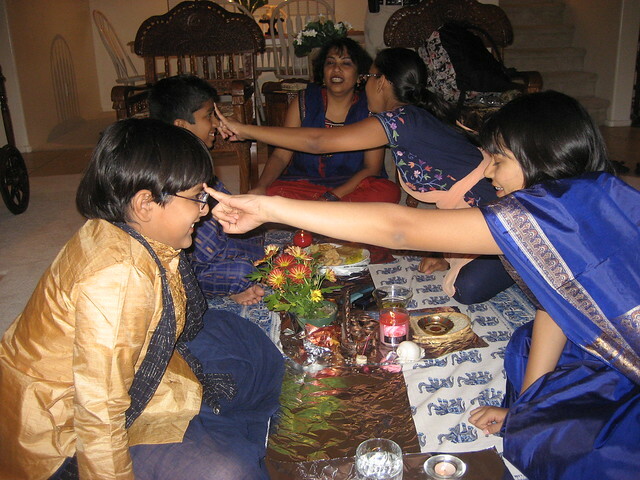 Sisters also offer Misti Doi or sweet curd to their brothers. Sister also makes Payash or kheer for their brothers. Brothers and sisters give gifts to each other after all rituals are over. 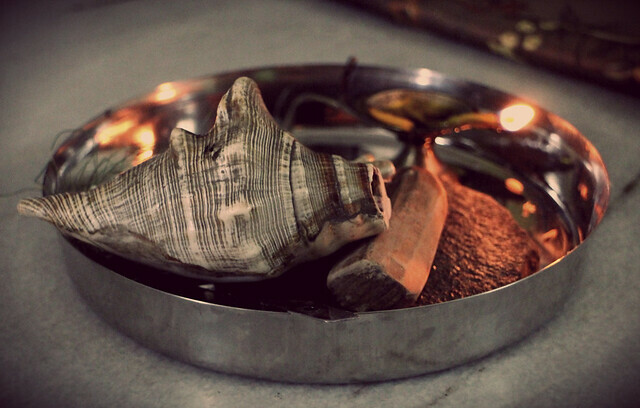 Bhai Phota, one of the most important festivals of Bengali Hindus, has legends associated with it. One legend is about Lord Krishna. As per this legend, Subhadra, sister of Lord Krishna, welcomed her brother with a lamp and put a tilak on his forehead when Lord Krishna came back after killing Narkasur. Another legend is associated with Rig Veda. Surya had twin children named Yama and Yamuna. Yama was invited by Yamuna at her house. When Yama, the God of Death, came to meet Yamuna, she prayed for prosperity, success and well being of her brother. Some legends of this festival are also associated with Lord Mahavira and Lord Vishnu. Kolkata is changing with the changing world. Nowadays celebration of Bhai Phota has changed a lot in this city. Brothers are no more waiting for the sweets, snacks and other dishes made by their sisters or bought from the market rather they want to celebrated this auspicious occasion in a renowned restaurant or shopping mall having lunch or dinner and/or doing shopping or watching movie at the multiplexes. Nowadays, paper card and e-cards are sent to the brothers on the occasion of Bhai Phota. Brothers also send online gifts to their sisters in return. No matter how the ways of Bhai Phota celebration have changed but the essence of this age-old remains the same and conveys the message of strong bonding between brother and sisters. This is the one of the major festival in Kolkata, in fact in west bengal. I was in Kolkata during this festival last. I saw the special enthusiasm in brother and sister on the day of this festival.